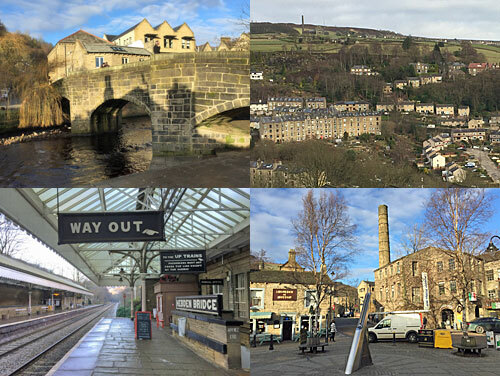 Todmorden is sited where three steep valleys meet, amid Pennine moors and upland sandstone grit. The setting looks gorgeous when the sun's out, but more oppressive in low-cloud gloom. A railway viaduct swoops across the heart of the town, and trains curve off in three directions - to Halifax, Burnley or Rochdale. Easily the most impressive building is the town hall, built in 1875 in full-on classical style. The boundary between Lancashire and Yorkshire once passed through the centre of the town, following the line of the river, and the Town Hall was deliberately built on top so that half the building was in each county. In 1888 the boundary was shifted west, gifting the town in its entirety to Yorkshire. Everyone who got upset is now dead. A modern memorial beneath the viaduct marks the original line, each side marked by a rose of the appropriate colour. Four miles downstream lies Hebden Bridge, the best known of the towns hereabouts, no doubt due to its density of lesbians. That's not why the place was once called Trouser Town, this was a nickname earned through clothes manufacturing. But after the mills closed the artists moved in, and many with alternative lifestyles found a safe home here. They chose well. 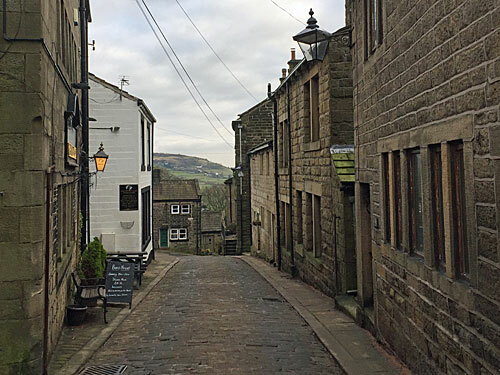 The town is gorgeous, squished into the Calder valley where a tributary joins, with residential streets perched precipitously on the surrounding slopes. Space for housing is at a premium so curious 4-storey terraces have been built, their tenancy split between the lower two floors (front door facing out) and the upper two floors (front door facing in). I thought I'd walk from Hebden Bridge to the village of Heptonstall - it looked barely half a mile on the map. But what my non-OS map failed to mention is how relentlessly uphill it would be, which is very much par for the course around here. A cobbled track led off innocuously from the edge of the town, rising through woodland to a tiny Methodist cemetery with panoramic views, then zigzagging onwards up irregular flights. I was damned glad of the handrail. 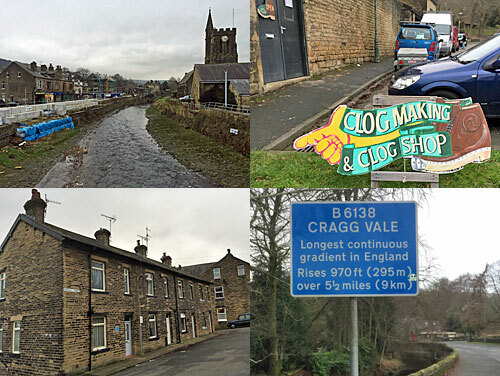 I also thought I'd walk from Hebden Bridge to Mytholmroyd, but that proved a lot easier. It's only a mile, nigh flat, and the Rochdale Canal links one to the other. Admittedly the towpath was in a bit of a state, still not recovered from the devastating Boxing Day floods a couple of years ago, but then neither has Mytholmroyd. The village is mostly linear rather than spreading up the slopes, hence considerably more at risk from inundation. Crumbled river walls can still be seen, as well as diggers filling in broken gaps, and deep concrete-lined channels hoping to prevent a repeat. The Environment Agency have even gone so far as demolishing the post office, and relocating services across the road, to widen the Calder alongside County Bridge. I didn't get this far, because there is a limit to how many Calderdale towns and villages you can visit with an off-peak rail rover. 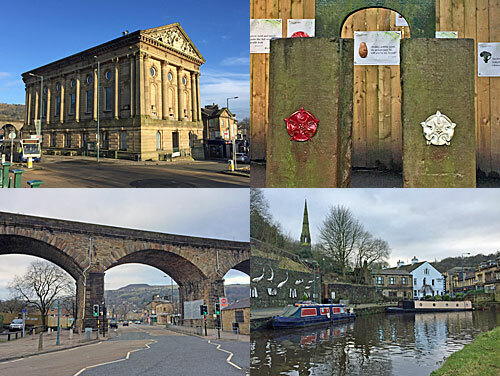 This riverside town is where playwright Sally Wainwright grew up, so has been inspiration for several of her dramas, most notably the BAFTA-winning Happy Valley. 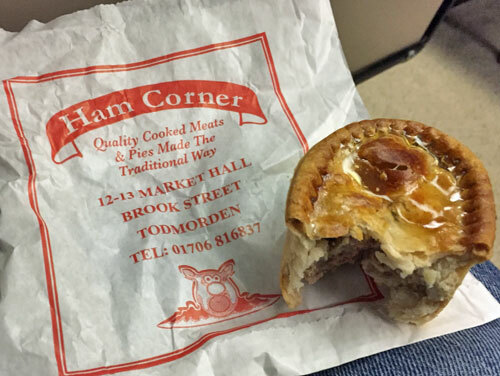 That said, I rewatched the start of the first episode yesterday and screamed "that's Todmorden, by the chippy!" at the TV, so successful had my Calderdale safari been.